Harrow is definitely Saxon in origin, as its place names can testify. It forms part of Middlesex, land of the Middle Saxon, and the coat of arms of the county displays three Saxon seaxes, which are curved notched short swords. During the ninth to the eleventh centuries there was a well established ecclesiastical organisation and the emergence of a simple system of local government. The first level was the Tun which later became town; it was made up of a group of homesteads. Families were bound together in groups of ten known as a tithing; each group had a head man and petty disputes could be dealt with at the chief’s house. The level above the Tun was the Hundred, which consisted of an area which had sufficient land to sustain a hundred families. The Hundred Court tried criminals, settled disputes, witnessed transfers of land and apportioned taxes. The final level was the Shire, which had civil and criminal jurisdiction. After the Conquest this Saxon form of local government was absorbed into the Norman feudal system and continued until the nineteenth century. Middlesex was divided into six Hundreds, and Harrow was included in the fifth, the Hundred of Gore, from Anglo-Saxon ‘Gara’ meaning corner of land. The land of Harrow was owned by the monks of Christ Church Canterbury until 1066, when Earl Leofwine, King Harold’s brother, took control of the area. After the Conquest William replaced Stigand the Saxon Archbishop of Canterbury with Lefrance from the Abbey of Le Bec Normandy and returned the control of Harrow to him. Under the Norman feudal system the manor was all important. In 1086 the Hundred of Gore consisted of Harrow (Pinner was a Chapelry of Harrow), Hendon, Kingsbury, Edgware, Little Stanmore and Great Stanmore. Harrow was the largest manor in Middlesex, consisting of sufficient land for seventy ploughs, pasture for cattle and woodland for two thousand pigs. It was fourth in monetary value and fifth in population. As Harrow was an archiepiscopal manor, it was farmed by tenants using the three crop rotation method, though the emphasis was on oats due to the clay soil; they also kept sheep, pigs and cattle. The northern part of the parish was woodland and therefore important for timber and charcoal. It attracted London merchants and courtiers to be landholders, among them Edward III’s mistress, Alice Perrers. During the unrest of 1381 Harrow residents did not appear to lack motivation in voicing their opinion regarding the opposition to the Poll Tax. Several disturbances occurred in Harrow and Pinner. When Archbishop Simon Sudbury, Lord of Harrow and Chancellor of England, was beheaded on Tower Hill by Wat Tyler, Harrow residents took advantage of the situation, refusing to pay rent and trespassing on the Archbishop’s property and destroying the manorial records. A royal inquiry followed and some of the inhabitants were excluded from the general royal pardon. Sir Nicholas Brembre, a landowner in Roxeth and Northolt and a Lord Mayor of London, had been knighted for his part in stopping the Peasants’ Revolt, but later put to death at Tyburn when it became apparent he had unlawfully executed twenty two prisoners. Some two hundred and fifty years later Harrow again rebelled against taxation and actively refused to cooperate over Charles I’s ship money. In 1635 the collectors had difficulty in obtaining payment in full and again in 1640 the Harrow residents opposed the king’s men and it is recorded that there were forty seizures of property for non-payment. Dr Richard Layton was the Rector of Harrow from 1537 to 1544, during which time he was commissioned by Henry VIII’s Chancellor, Thomas Cromwell, to undertake the leadership of the Visitation of the Monasteries, a task he seemed to relish. He is particularly remembered for exhuming Thomas Becket’s remains and burning them; he totally destroyed the magnificent shrine and the treasures were taken to Whitehall. On 30 December 1545 Archbishop Cranmer was forced to hand the manor over to Henry VIII who sold it six days later to Sir Edward Dudley, Chancellor of the Court of Augmentations. It remained in his family’s ownership until 1630. During the sixteenth and seventeenth centuries Harrow became popular amongst the gentry as the ideal location, due to its proximity to London for parliament and court. Several notables had residences on and around the Harrow-On-The-Hill, which accounted for its popularity and growth. In 1562 Harrow was shown in the background of the topographical drawing of London commissioned for Philip of Spain on his marriage to Mary Tudor, a testimony if any to signify the area’s importance. John Lyon, an educated wealthy farmer and landowner, had longed to set up a school in Harrow on the lines of Eton and Merchant Taylor’s. His patience was adequately rewarded in 1572 (Tudor calendar 1571) when together with his friend Sir Gilbert Gerard, the Attorney General, who owned an estate in Sudbury, they were granted a royal charter by Elizabeth I. The first Governor of the school was Gerard’s brother, William Gerard, who lived in a house called Flambards located on Harrow-On-The-Hill, and which was used as the school until John Lyon built his school in 1615. William Gerard enlarged the town well, erecting a pump house to provide water for all the tenants, and laid pipes to provide water at Flambards. 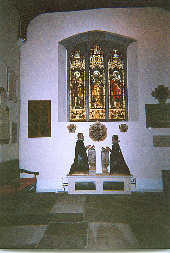 Both John Lyon and William Gerard have monuments in St Mary’s, Harrow-On-The-Hill. By the seventeenth century the manor consisted of a windmill and eight hundred acres and William’s son Gilbert spent £3000 on further improvements. In 1664 Flambards was the largest house in the parish of Harrow; it had twenty five hearths, which became a liability when the Hearth Tax was introduced between 1662 and 1689. The house was pulled down sometime towards the end of the nineteenth century to make way for more houses, due to the railway boom. During the 1630s Sir Gilbert Gerard became involved in a series of disputes with a George Pitt over the enclosure of Sudbury Common to be used as a rabbit warren. Gerard championed the tenants’ cause against Pitt. The dispute became nasty when Gerard as JP sentenced Pitt’s warrener to prison for supplying bowls on Whit Sunday, and Pitt cut down the elms in front of Gerard’s house, which led to Gerard taking the case to the Star Chamber. In 1640 the landowners and tenants finally agreed to the warren at Sudbury. Gerard had used his position to protect the rights of the common for the tenants. It is interesting to note that the Gerards are a typical civil war family in that they were split over their support for both sides. That part of the family descended from Attorney General Sir Gilbert actively supported the king; his great grandson Charles, first Baron Gerard of Brandon, fought at Edgehill, Lichfield, Bristol, Newark and Wales, left England with Prince Rupert and became Vice-Admiral of the royalist fleet in 1648, and it was he who was the instigator of his cousin John Gerard’s planned assassination of Cromwell. Colonel John Gerard was arrested in May 1654 and stood trial on 3 June for his part in planning to kill Cromwell on the way to Hampton Court Palace. He was beheaded on 10 July 1654. A full and detailed account of the plot can be found in S R Gardiner’s History of the Commonwealth and Protectorate volume three. Another cousin, Richard Gerard, cornmanded the bodyguard which escorted Henrietta Maria from the Hague to Bridlington Bay and he fought at the second battle of Newbury. That part of the family descended from William of Flambards supported parliament and his grandson, Sir Gilbert (knighted by James I), became involved in the puritan network of marriage alliances when he married Mary Barrington, first cousin to Oliver Cromwell. Sir Gilbert was Member of Parliament for Middlesex, sitting in five parliaments between 1623 and 1640. He became Chancellor of the Duchy of Lancaster and sat in Cromwell’s Upper House. He became actively involved in the puritan movement to found puritan colonies in America; during the 1630s there was a great migration, and Gerard gave his support to his brother-in-law, Sir Thomas Barrington, and the Providence Island Company. He served with Hampden and Hesilrige on the Grand Committee for Religion to investigate the growth of popery, the decay of preaching and scandalous ministers. He was dismissed from his position as magistrate over his opposition to the ship money. During the summer of 1640, Sir Gilbert and another wealthy puritan, Sir William Roberts, together led the opposition in Middlesex in refusing to pay coat and conduct money for a new expedition against the Scots. Though there was no fighting in Harrow, there is evidence from a 1643 dispatch that there was a military establishment at Harrow-On-The-Hill, where officers received their orders. Sir Gilbert raised a regiment on parliament’s behalf from Harrow men and later was responsible for 4000 auxiliaries. He served as ‘Treasurer at Warres’ for parliament and announced in February 1643 that he was unable to pay the troops as the coffers were empty and that it would be necessary to levy regular taxes. A committee was appointed which led to a tax of five per cent, monthly contributions, and the rents of sequestrated estates. In 1854 an old town well was filled in and Harrow school house, Rendalls, was built. In 1925 a plaque was placed on the building stating it was the location of the well where Charles I watered his horses on his flight from Oxford in 1646. Apparently his horse needed a shoe, so one of his companions took the horse to the blacksmith which stood near what is now Station Road. 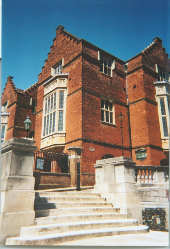 Harrow is accessible by road via the A40, by British Rail and by the Underground. 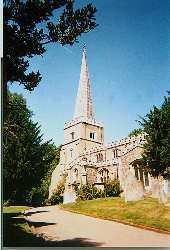 It is worth a visit to see the school museum, St Mary's Church and the Headstone Manor Museum. Copyright © 2001-2005 All material on this site is the copyright of the individual author and or the Association and or the Cromwell Museum, and may not be published elsewhere without permission.